Celebrate Summer With a Creative Trek Through Eckert’s Sunflower Maze. Five acres of excitement await. Perhaps you’ll imagine you’re a tiny ant in the midst of a jungle of grass blades. Perhaps your kid will become a pirate, hunkering through a long labyrinth of caves. Or maybe you’ll both become little fleas, lost in a field of cat fur. 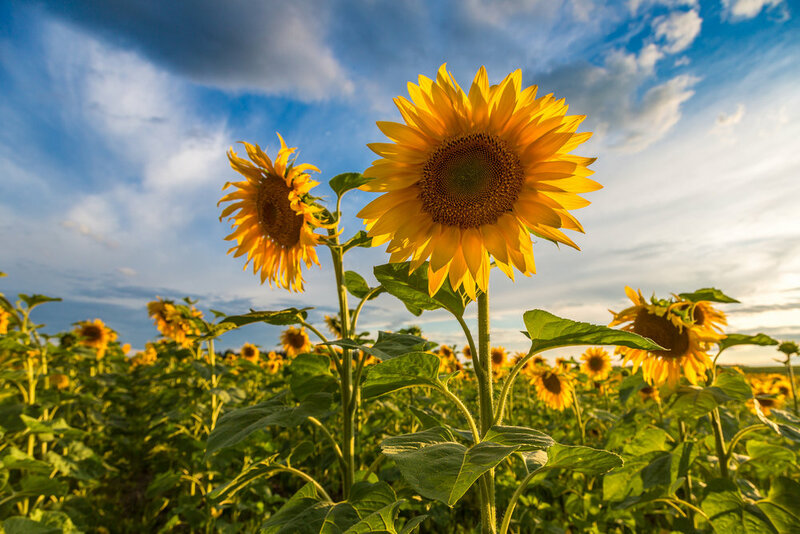 The possibilities for creativity, exploration and adventure are endless when you head to into the latest attraction at Eckert’s Belleville Farm: our glorious Sunflower Maze. Our Sunflower Maze uses the same concept as a corn maze, but with sunflowers instead. That means you can get up close, personal and even tickled by gigantic flowers that can’t help but make most people smile. You’ll find our Sunflower Maze near the pick-your-own vegetable area. To gain access to the maze, it is an additional $3/person. Make sure set aside adequate time to fully enjoy the experience, as our Sunflower Maze spans and sprawls for a full 5 acres of fun. Please note, the Sunflower Maze is CLOSED for the 2018 Season. Thanks to everyone that came out to explore this summer. Eckert’s mission is to provide memorable family experiences, and our own family has owned the business for seven generations now, so you can bet we’ve had plenty of time to come up with new and exceptionally creative ways for families to enjoy their time together. So far, our Sunflower Maze ranks as one of our favorite ideas. We hope it becomes one of your favorites, too, especially because there’s much more to our maze than just rushing about to find the exit. You and your kiddos can learn a lot from our Sunflower Maze. Like the fact that sunflowers can grow taller than people. Or that sunflower seeds are one of the healthiest snacks around (try reminding your kids of that the next time they ask for a candy bar). Sunflowers also mean different things to different cultures. Native American groups tend to associate sunflowers with bounty, harvest and provision. People in China may look at sunflowers as signs of good fortune, vitality and longevity. Many cultures view sunflowers as symbols of loyalty and adoration. While our Sunflower Maze may initially appear to be all for fun, kids and adults alike end up working on important skills as you weave in and out of the paths. You’ll get to work on problem-solving skills as you maneuver down the lanes. Your memory will get a workout to ensure you don’t maneuver down the same aisles again and again and again. You and your kids will relish the sensory experience of being in the heart of nature, feeling the stalks, smelling the aromas and hearing the wind sift through the leaves. Nature appreciation definitely comes into the picture during a Sunflower Maze trek, and it’s really rather easy to appreciate sunflowers. You’ll also get a huge dose of outdoor fun and family bonding. You and your kids are, after all, in this together. It’s up to you to think, act, communicate and otherwise work as a unit to successfully get through the winding passageways to make it out the other side. Kick your creative family time into high gear with a trek through Eckert’s Sunflower Maze today. Sunflower Maze is CLOSED for the 2018 Season.